As it has been the case for some years now, Houston is still searching to bring back the title to the city. They will have a tough competition with the Spurs who finally get two interesting players for Kawhi with DeRozan and Poeltl, and the Pelicans, who hope to be back in the playoffs in a loaded Western Conference. Dallas and Memphis are trying first to have better seasons than last year, with Dallas more rounded to surprise this year. There is only one goal for Paul and Harden, the crown, nothing else. Add Capela to the two stars, Houston still has the core to reach the Conference finals. Yet, Houston lost some important pieces, most notably at the wing with the departures of Ariza and Mbah a Moute, two defensive guys, but also the shooting of Ryan Anderson. Instead, they are taking a gamble on Carmelo Anthony, a ball hog who doesn’t show great defensive presence and two more interesting players from Phoenix, Brandon Knight and Marquise Chriss. 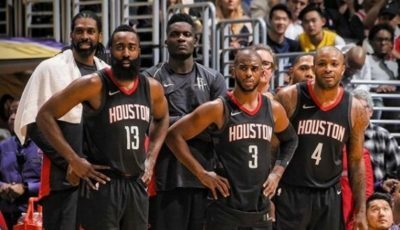 If Paul stays healthy and the newcomers bring their qualities, shooting for Knight and Melo and rebounding and defense for Chriss, maybe Houston could bother the Warriors. The Kawhi drama is finally over and the Spurs got a pretty good deal. Not only is DeRozan one of the top guards in the League, but Poeltl is a solid center who could solve the issue of the aging Gasol at this position. Everything is not perfect as this team has some flagrant weaknesses. First of all, now that Parker is gone and with the injury of Murray, Mills is almost alone to handle the PG duty with Derrick White. Then, the Spurs may lack some shooting from its starters as it has never been DeRozan’s strength. The team is solid but may lack some special talent to get out of the pack in the West. Let’s see if Pop can do miracles but it may be another rebuilding year for the Spurs. Despite Cousins’ injury, the Pels had a successful season and will rely on it to succeed even more. Anthony Davis still is the same unicorn who can dominate on both ends of the floor and can count on Mirotic and newcomer Julius Randle, who may play some small ball five to let AD play at his natural four spot. New Orleans has not been able to prevent Rondo from leaving so they have added Elfrid Payton, another defensive PG who still has room to improve. After a stellar season, Holiday will mainly play at the two where he will have the ball tos core and will be asked to erase the opponents’ best guard. The main weakness is at the SF spot where Solomon Hill may start once again, a poor starter compared to the Durant, James, George or even solid starters like Ingles. After some lackadaisical seasons, the Mavs could see real improvement thanks to the nice additions they bring to the roster. First, they signed a local star, DeAndre Jordan, who will adress Dallas’ lack of rebounding and rim protection. Then, they drafted the guy they wanted, Eurostar Luka Doncic, who may start at SG and display creativity and shooting. He will form a complementary pair of rising stars with Dennis Smith, the uber athletic PG of the future. The PG spot is also solidified by the draft of Jalen Brunson, one of the most efficient player in college basketball and a real floor general. The team may lack some talent at the four spot as Nowitzki is slowly going into retirement mode. Powell but also maybe rookies Spalding or Antetokounmpo may get some lessons before the Wunderkid leaves. Despite the fact that Memphis has lost its best scorer, Tyreke Evans, who signed for a more promising Indiana Pacers squad, the staff has used the draft to pick a potential future changing player. Jaren Jackson Jr has the size, athleticism but also shooting to be one of the best PF in the League. Gasol and Conley are aging and it may be difficult for them to see the playoffs again if they don’t change teams. On the wing, some scoring is expected from both Brooks, Parsons or Selden. Among newcoming vets, Kyle Anderson may be the only important addition while rookie Jevon Carter could learn a lot under Conley’s tutelage.